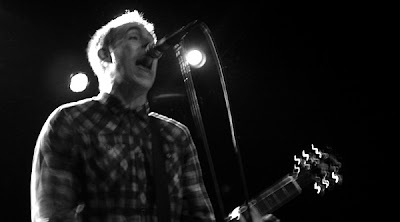 Ted Leo and his non-licensed Pharmacists really need no introduction as they have made a name for themselves over the past decade, releasing quality albums and energizing crowds with their high-octane live performances. So it was a real treat for me to have finally caught this spectacular band at Irving Plaza on the heels of releasing their sixth studio album, The Brutalist Bricks. What I saw at Irving Plaza was pretty much what I expected out of a Ted Leo show: lots of energy, plenty of decibels, a large Ted Leo following, and a bunch of fun. As many who have witnessed a Ted Leo show, you'll soon realize that they don't really have any slow songs; this makes for a fast-tempo, guns-blazing show. From the opening notes from "The Mighty Sparrow" until the final notes of their Misfits cover "Angelfuck", it was an almost nonstop fury of riffs and sweat; the first couple of songs during the encore included a Ted Leo solo that reduced the riffage and produced the only calm moments of the show. All in all, it was a fantastic show. I was very impressed with their stage presence and I enjoyed hearing their new material performed superbly. I would highly recommend catching Ted and the Rx when possible and definitely grab a copy of The Brutalist Bricks, which is in stores now.